We think there is much misapprehension as to what the quota of this county will be under the last call. 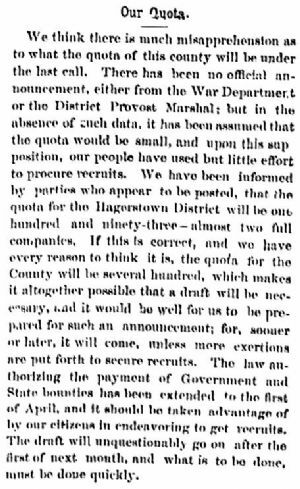 There has been no official announcement, either from the War Department or the District Provost Marshal; but in the absence of such data, it has been assumed that the quota would be small, and upon this supposition, our people have used but little effort to procure recruits. We have been informed by parties who appear to be posted, that the quota for the Hagerstown District will be one hundred and ninety-three - almost two full companies. If this is correct, and we have every reason to think it is, the quota for the County will be several hundred, which makes it altogether possible that the draft will be necessary, and it would be well for us to be prepared for such an announcement; for, sooner or later, it will come, unless more exertions are put forth to secure recruits. The law authorizing the payment of Government and State bounties has been extended to the first of April, and it should be taken advantage of by our citizens in endeavoring to get recruits. The draft will unquestionably go on after the first of next month, and what is to be done, must be done quickly.